Wearing them not only protects against neck and eye strain, but it also may help to reduce the number of headaches a worker experiences. When choosing safety glasses, a good fit is important, since this will make wearing them more comfortable. Poorly-fitting eyewear is more likely to be discarded by the wearer. They can't protect the eyes if they aren't in place. A style that protects the side of the face, as well as the front, is preferable. Having a high-impact lens on the safety glasses isn't going to provide the appropriate level of protection if the hazard comes at the wearer from an angle instead of head-on. Dual bifocal safety glasses are a better choice than bifocal safety glasses for people who need vision correction to see things that are close to them. In much the same way that bifocal reading glasses can correct vision for reading and seeing objects that are in front of the person's face, this type of safety goggle can only correct vision for the user in that particular range. The lenses are equipped with a single power in their bottom section. The upper part of the bifocal safety glasses is made from non-prescription materials. The person wearing them only gets the benefit of superior vision when trying to read or see objects that are close by. A person who is working with equipment like power tools can benefit from this product. Wearing dual bifocal safety glasses means that the individual gets the benefit of vision correction for objects that are further away, as well as being able to read while wearing them. They are a good choice for a person who is nearsighted, which means they have difficulty focusing on things unless they are relatively close to the eye, and farsighted, which describes difficulty in seeing things that are in close proximity. For a person who has both of these vision conditions, wearing dual bifocal safety glasses is a reasonable choice. The upper section of the lenses is designed to correct vision for objects at a distance. The lower section of the lenses functions in the same way as bifocal reading glasses do, and allow the user to read and see things that are close. 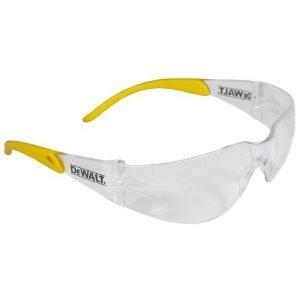 Visitors to the Safety Glasses Inc. web site can check out dual bifocal safety glasses with clear lenses. The models available have either 1.5 or 2.0 lens strengths. T.A.S.C.O. Safety sells dual bifocal safety glasses offering 99.9 percent UV protection to the wearer. The safety glasses offered by this company are not designed to be worn while in motion, which includes walking and driving. This company carries the Smith Wesson 30.06 Dual Reader with a clear lens at either a 1.5, 2.0 or 2.5 strength. Gallaway carries the Smith & Wesson Olympic 30.06 Dual Segment safety goggles. They are available with a clear lens in 1.5, 2.0 and 2.5 strengths. The frame is black.